On the internet today, reading something twice is an act of love. I’ve found a few services recently that encourage me to return to things I’ve already read. Findings is looking quite lovely since its recent redesign. They may have screwed up with their email notification anti-pattern but they were quick to own up to the problem. I’ve been taking the time to read back through quotations I’ve posted, which in turn leads me to revisit the original pieces that the quotations were taken from. We need to break out of the model where all these systems are monolithic and standalone. There’s art in each individual system, but there’s a much greater art in the union of all the systems we create. …which leads me back to the beautifully-worded piece he wrote on Medium. Not of This Earth is an early example of a premise conceivably determined by the proverbial writer’s room dartboard. In this case, the first two darts landed on “space” and “vampire.” There was no need to throw a third. You could look at this film superficially and see it as a robot gone mental chasing Farrah Fawcett around a moonbase trying to get it on with her and killing everybody that gets in its way. Or, you could see through that into brilliance of this film and see that is in fact a story about a robot gone mental chasing Farrah Fawcett around a moonbase trying to get it on with her and killing everybody that gets in its way. The other service that is encouraging me to revisit articles that I’ve previously read is Readlists. I’ve been using it to gather together pieces of writing that I’ve previously linked to about the Internet of Things, the infrastructure of the internet, digital preservation, or simply sci-fi short stories. Anthologies have the potential to finally make good on the purpose of all our automated archiving and collecting: that we would actually go back to the library, look at the stuff again, and, holy moses, do something with it. A collection that isn’t revisited might as well be a garbage heap. I really like the fact that while Readlists is very much a tool that relies on the network, the collected content no longer requires a network connection: you can send a group of articles to your Kindle, or download them as one epub file. …users gain new ways to select, sequence, recontextualize, and publish the content they consume. I think the first technology that really brought this notion to the fore was RSS. The idea that the reader could choose not only to read your content at a later time, but also to read it in a different place—their RSS reader rather than your website—seemed quite radical. It was a bitter pill for the old guard to swallow, but once publishing RSS feeds became the norm, even the stodgiest of old media producers learned to let go of the illusion of control. every RSS reader I tested it in displayed the articles differently — completely destroying my line widths, pull quotes, image captions, footers, and the layout of the high‐DPI images I was using. …but that kind of illusory control just seems antithetical to the way the web works. the author’s moral rights over the form and presentation of their work. How can I force the user to …? How do I stop the user from …? The questions usually involved attempts to stop users “getting at” images or viewing the markup source. Again, I understand where those views come from, but they just don’t fit comfortably with the sprit of the web. And, of course, the truth was always that once something was out there on the web, users could always find a way to read it, alter it, store it, or revisit it. 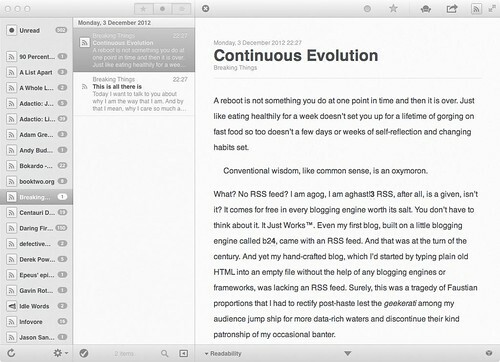 For Aral’s site, for example, although he refuses to provide a full RSS feed, all I have to is use Reeder with its built-in Readability functionality to get the full content. This is an important point: attempting to exert too much control will be interpreted as damage and routed around. That’s exactly why RSS exists. That’s why Readability and Instapaper exist. That’s why Findings and Readlists exist. Heck, it’s why Huffduffer exists. To paraphrase Princess Leia, the more you tighten your grip, the more content will slip through your fingers. Rather than trying to battle against the tide, go with the flow and embrace the reality of what Cameron Koczon calls Orbital Content and what Sara Wachter-Boettcher calls Future-Ready Content . Both of those articles were published on A List Apart . But feel free to put them into a Readlist, or quote your favourite bits on Findings. And then, later, maybe you’ll return to them. Maybe you’ll read them twice. Maybe you’ll love them.